The admission process has undergone a metamorphosis over the past decade. You can register your child, book a tour and get a virtual feel of the school while comfortably ensconced in your favourite armchair, two continents away. And that, perhaps, is precisely what the young parents waiting to join the workforce in Dubai are currently doing. With the population of Dubai expected to rise to more than 2.8 million by the end of 2017 and close to 5 million by 2030, as per Dubai Statistics Center estimates, schools and housing will have to keep pace. The buzz around the 20 odd new schools expected to open in Dubai over the next year is palpable. Thomas Friedman said there are times when we need to give ourselves permission to pause. Choosing a school for your child is not a decision to be made in a hurry, and if school websites are to be the deciding factor, then be forewarned — caveat emptor! If a school is promising you the moon, your eyebrows should be suitably raised. Of the new schools expected to open over the next year, many will have websites and promotional material created by advertising agencies with perhaps limited input from the education team. With 185 private schools in Dubai, is there room for more players? It would be interesting to predict what theory Malthus would have propounded with regard to the increase in population versus school openings! With the attention that the government is placing on education, wisely making it a National Agenda priority, a lacuna does exist, and needs to be plugged. The business of education is serious. And the well-established and reputed education organisations have the expertise and wherewithal to open new schools after careful research and due diligence. 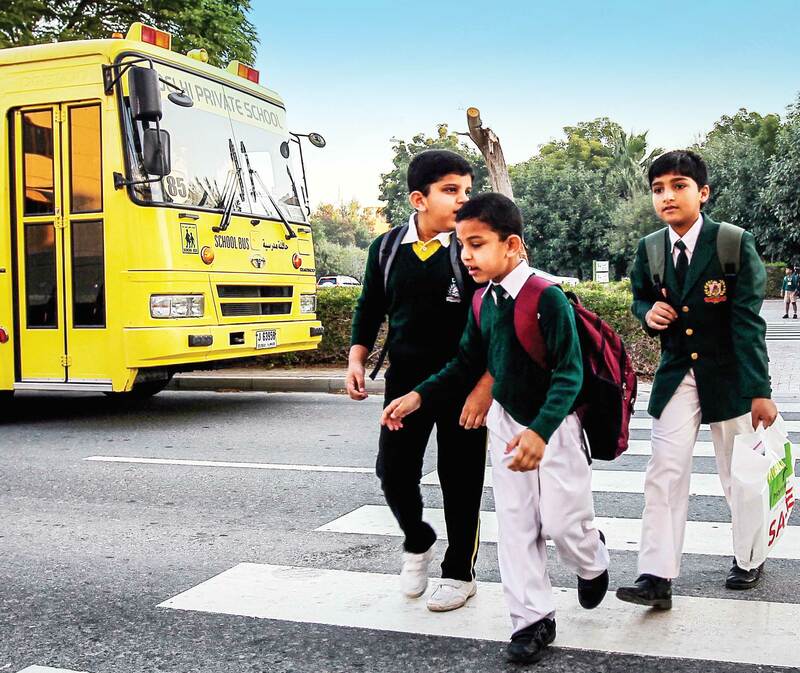 The schools consistently rated ‘outstanding’ and ‘very good’ by the Dubai School Inspection Bureau (DSIB) have been around for years and have solid reputations. With most known ‘brands’ poised for expansion, why would the KHDA* run the risk of inviting new entrants into this market? Will schools that have a reputation in their home countries adapt to the local educational scenario? Will parents be tempted by perceived benefits, switch to a new school leading to a potential gap in learning, despite their child’s current school providing quality education? Having closely interacted with KHDA personnel, my colleagues and I have huge respect for their professionalism, strategic thinking, capacity to innovate, understanding of educational issues and commitment to putting UAE on the educational map of the world. There is no doubt that if a school has been granted permission to open in Dubai, the education plan would have been scrutinised, their staffing, accommodation schedules and regulatory obligations met with. It is important for KHDA to offer diversity with 15 different curricula on offer. The questions that arise are: What value will the new schools add to the existing standard of education in this country? What will that mean for parents? Will K-12 education cost less? Expatriates may willingly make personal sacrifices, but will certainly not compromise on the quality of education for their children. I remember one father who was going through difficult times declaring emotionally, “I will sell the shirt off my back if I have to, to ensure my daughter gets a good education”. For the well-heeled, there is a wide range of schools with state-of-the-art facilities to choose from. For the larger proportion of middle and lower income segments, there are several factors to consider before they sign on the dotted line, with the price point often being the decider. Too much choice can lead to befuddlement and yet, lack of choice can lead to unhealthy monopolisation. Having to cater to different curricula, price points and locations (especially with new townships mushrooming all over Dubai), the established schools are bound to have a definitive advantage. The unique proposition of each school is what sets it apart. I can confidently say that parents will travel far distances if they are guaranteed quality education, choice of curriculum, sound pedagogical practices, emphasis on extracurricular activities, ethos across the school, student-teacher relationships, parent engagement, ethical leadership, with health, safety and wellbeing of the child being paramount. Growing up in a small cantonment in India, there were only three English medium schools in my district, so it was Hobson’s choice really! My parents selected a school established by the East India Company in the 1870’s for all the reasons stated above and one more — my father and all my siblings had studied there! We all did our entire schooling from Kindergarten to grade 11 in the same school. Those days, there was no question of changing schools, unless your parents belonged to the armed forces or had a peripatetic job. There is a worrying trend among some parents, who have been here for a few years, to transfer their child to a different school after a few years. That could be for considered reasons — perhaps a change of curriculum. Or for reasons that seem relevant from a parent’s perspective — the child’s friends have moved to a different school. The curriculum is too difficult. The teachers are not good enough. The child does not get sufficient opportunities to excel. My principal colleagues and I have often had to readmit students (and teachers!) who have left for some of these reasons, joined another school for six months and have then come back as they found that the grass is not greener on the other side. No institution is perfect. And parents should ideally work in partnership with the school teams if they want a matter addressed. Counselling helps as well. Most schools have experienced counselors. And timely advice saves anguish later on. If I were a parent, I would visit the shortlisted schools based on curriculum preference, school fees that suit my budget and a scrutiny of the school’s DSIB report with an eye on the strengths and areas for improvement. During my visit, I would check on the school’s philosophy around five core areas — academics, extracurricular activities, emphasis on the overall development of personal and social responsibility and prevalent opportunities for community service and care for the environment. Do the children and staff seem happy? What is the quality of the students’ work on display on the classroom boards (if there are few displays and more emphasis on beautification, I would worry). If the school is brand new, I’d like to know their academic plan for the year I am admitting my child to, including school trips and excursions. How does the school add value to my child? While the school results are important, it is equally important to know the school’s strategy to enhance the outcome of the students. Did anyone on the senior leadership team want to know what my child excels at, what is her ambition, what are her dreams; did anyone want to know what I want for my child? These are important considerations before making the all-important decision. Once you decide, unless something drastic happens, work with the school’s teachers and management and enjoy the academic journey with your child, knowing that you have chosen well. You will marvel as you watch your child grow into a confident, self-assured, active, contributing member of society. The progress of a nation depends on the quality of education it imparts and the UAE has made education a national priority. All of us principals are working very hard with our teams, shoulder to shoulder with the government, to ensure that we put UAE on the map by scaling up to the 15th position in PISA** and 20th position in TIMSS*** . Where there is a will, there is a way!